The famous Golden Rock Pagoda is said to have a gap where a piece of paper can slide through. I did not see any gap but then the lady guide was not permitted near the Golden Rock. Devotees believe the legend that the hair relic of Gautama Buddha enshrined in the pagoda had the power to stop the boulder from falling off the table top into the valley of Mt Kyaiktiyo which is 3615 feet above sea level. 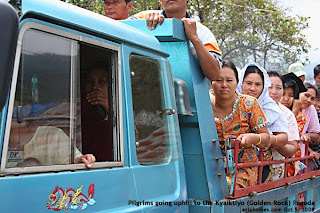 In my October 2008 tour, my party reached the base of Mt Kyaiktiyo at around 6 p.m. Just in time for the last truck to go up to the Halfway house. The truck was filled with pilgrims. My left foot was still hurting after my fall on Day 1 at Yangon. But I managed to squeeze my leg in between the wooden planks which are around a leg's width. As the truck roared uphill, the dark storm clouds burst. I ought to have brought a water-proof plastic to protect my camera but it was too late now. One of the slim ladies - a pilgrim farmer, in front of me lent me her spare umbrella. I thanked her. My guide was soaked. I needed the umbrella to protect my camera. The rain poured in buckets. The trunk grunted uphill and turned corners shining its bright headlamps. It was one-way traffic and the driver was good. We reached a dimly lit fluorescent roof and a shop. Burly dark-looking men in shorts and tattoos. Hats covered their faces. Greyish cheerot smoke spiralised upwards. I thought this was the military checkpoint. No, it was a provision shop. Our tour guide purchased raincoats for us. She was already soaked to the skin and shivering. A tough lady who would sample every local noodle dish in various destinations. It was cold and wet as we shot upwards to the top of Mt Kyaiktiyo. The rain threshed the group of pilgrims and my group. It was not the typical 10-minute shower in Singapore. After some time, the truck stopped at the Halfway house. I returned the umbrella back to the kind farmer. Instantly I was soaked in cold bullets of rain. I carefully put one good foot on the ladder provided to climb down the high truck. To avoid falling and crashing to the ground some 6 feet down. Cold rain soaked me. I managed to alight safely. Shivering started. Hypothermia. Hot cups of tea offered and drunk. Shivering continued. Drank more hot tea. The tour guide was bargaining with the palanquin bearers who demanded double the usual fee as it was raining cats and dogs. There was no alternative actually. No more trucks were permitted to go up to the Mountain Top Hotel at night. There would be another 30 minutes by walking. It was too dark and too risky to drive. The government forbidded tourists to go by car to prevent any accidents to tourists. The other pilgrims had already alighted and made their way to the much more affordable huts and accommodation around the Halfway House. I could not walk. A disabled person. So palanquins were the answer. The picture above shows a palanquin going down Mt Kyaiktiyo. Everything could be seen during daytime. But on that dark and gloomy night, it was an uncommon experience for city folks like me and my Singaporean office ladies. Lightning flashed around corners as the palanquin bearers marched uphill. Just like bombs exploding in Baghdad flashing their light when they landed if you had watched the TV during the Iraqi War. I don't know whether lightning would strike me. I was exposed on one side of the mountains as the 4 men marched uphill. Some smoked the cheerot. I had time to reflect on my past. How fortunate I had been. No major illness, no high blood pressure or diabetes at the age of 58 years. Here, I was exposed in the palanquin to non-stop multiple forked lightning bolts. 4 thin men who needed to earn a living carried me, braving the rain. Upwards their slippers swished. After some 15 minutes, they slowed down. Put me down. They could rest and smoked the cheerot. My raincoat covered the camera and shoes well. Swishing of the slippers of the palanquin bearers continued. Clear raindrops swished past me. Visibility was very poor. I could see the shadows of trees when lightning struck. The bearers grunted as they talked and swung to the rhythm of cornering. One command and they shifted the poles onto the other shoulder after a while. It was hard labour carrying an adult human of 80 kg up the hill for over 30 minutes. Reached Mountain Top Hotel after a long time. The other family members and guests were somewhere in front of me. Finally we reached Mountain View Hotel. All safe and sound. The rush to change to dry clothes. The two office ladies were not pleased with this encounter with nature. Soaked to the bone. Hypothermia. Wet, wet, wet. Complaints. 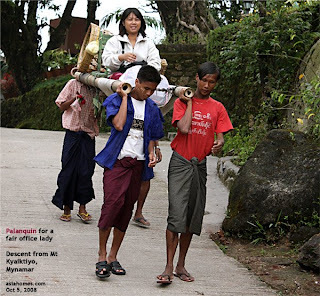 The guide had left their luggage at the bottom of the hill as the bearers demanded a lot of money to carry the luggage uphill manually in their baskets. So the guide got the luggage in the van with the driver who stayed at the foot of Mt Kyaiktiyo. 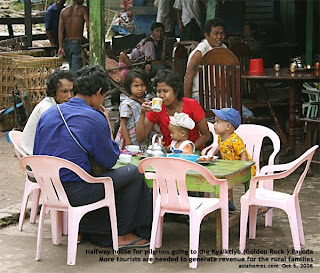 Lesson for tour guides to Mt Kyaiktiyp: Ask the tourist to take along another set of clothing for the overnight stay when they get into the truck. Give them raincoats and provide umbrellas. The front of the truck has some seats (cost more) for those who wish to avoid the rain. The memorable experience and fun for those who are able to appreciate nature is the drenching of the rain on the way up. But few readers will agree with me? Well, the best time to go up to the Golden Pagoda may be during the afternoon. There may be no thunderstorms during daytime, it seems. We descended during daytime. There was no rain at all. Oct to April are the dry seaons and usually there is no rainfall. Get a plastic bag to protect your camera in case it rains! I do read about this advice in travel magazines but did not heed it.